Well, we are leaving the fun decorations of Halloween and into fall and Thanksgiving. This is my first fall posting and I think it is a winner. 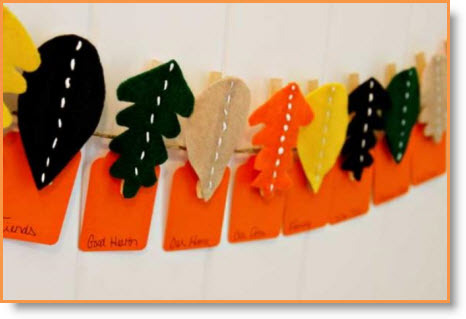 Start a new Thanksgiving tradition with this felt leaf bunting decoration. It’s a long standing tradition in Vanessa’s family to go around the dinner table and say what we are thankful for on Thanksgiving. She loves hearing what others are thankful for and looks forward to this little tradition every year. She thought she would take their traditions and do something a bit more creative with it this year. Step 1: Cut leaf shapes out of felt. You can freehand a leaf template or use an existing stencil. And use embroidery threads to hand sew a vein down the middle of the leaves. Vanessa Rodriguez Coppola is a Contributor on the “celebrations” web site and has her own blog “See Vanessa Craft”! Step 2: Attach the felt leaves to clothespins using hot glue, and then string the leaves along jute or string. Step 3: Have your Thanksgiving guests write what they are thankful for on pieces of coordinating paper and hang in the clothespins. This is a precious idea and I thank Vanessa for sharing.